Just a quick post to update y’all on all of the new booze I’ve gotten recently. No recipes this time, but I wanted to get everyone excited about all the things I’ll be posting on during the Holidaze and Winter Times! Cheers to you all! Berentzen Icemint Schnapps: Look at it? Isn’t it beautiful? It’s also 100 proof and the mint flavor is so clean that I have to say…I like it even more than Wondermint! I’ve been sipping Icemint Schnapps neat, on the rocks and am working on a few cocktails! 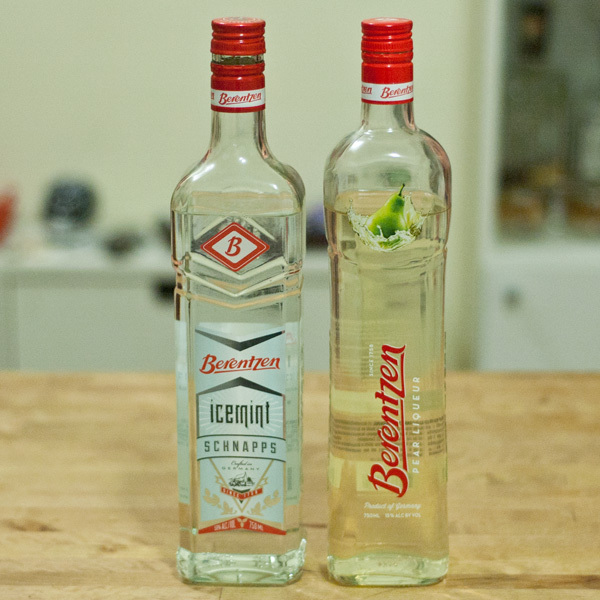 Berentzen Pear Liquer: In the same way that the Bushel & Barrel is fruit forward, crisp and clean, the Pear Liqueur kills it! Very fresh and bright pear flavors! I’ve been using it a lot with Gin. Today in the mail, I got these four beautiful bottles of delicious possibilities courtesy of MBooth Marketing. Aren’t they kind? I think they’re pretty kind. YOU’RE SO KIND MBOOTH! Y’all I’m gonna make a LOT of Holiday Cocktails with these! Campari: You know it, you know I love it. Negroni for life! 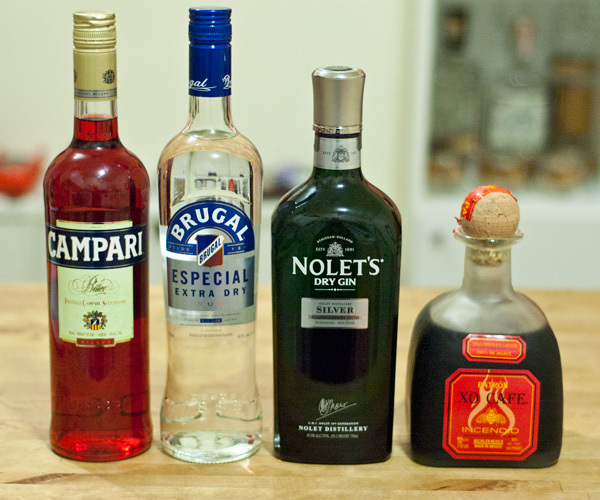 But Campari isn’t just Negroni, it’s the best citrus bitter Liqueur! I’m gonna use it in punches! Brugal Especial Extra Dry: This is a totally tasty dry Rum and such a bang for your buck! Toasted marshmellow, vanilla, coconut and citrus. I’m gonna use it in ALL the hot cocktails I possibly can! NOLET’S Dry Gin Silver: I’VE BEEN WAITING FOR THIS AND IT WAS EVERYTHING I IMAGINED! Seriously though, such a fabulous gin. Raspberry, Turkish Rose and Peach notes are happening and NOLET’S is super smooth. I’m gonna use this every day? In every cocktail? Maybe! Definitely going to make some Martinis and a Martinez with it. Patrón Cafe Incendio: I’ve been wanting a Chocolate liqueur and with my endless quest for spicy foods and drinks, Incendio fulfills my every need! Chocolate first, Chili spice next and the spice sits nicely on the tongue. I’m definitely planning to use it in Coffee Cocktails, with Añejo Tequila and with Rum. And then, here’s the recent acquisitions that I bought from the store! Corralejo Añejo: I LUV Corralejo. Their Reposado is my favourite one to sip and so now that it’s Añejo season, I simply had to get this bottle. I’ll be using it in Old Fashioneds, with the Patrón Cafe Incendio, and sipping it neat. St. Elizabeth Allspice Dram: Holiday spice in a bottle! So much Allspice! Like the NOLET’S gin, I’m probably going to use this every day in every cocktail I possibly can: Rum, Gin, Bourbon, Añejo, Apple Brandy. All of it. Allspice Dram forever! 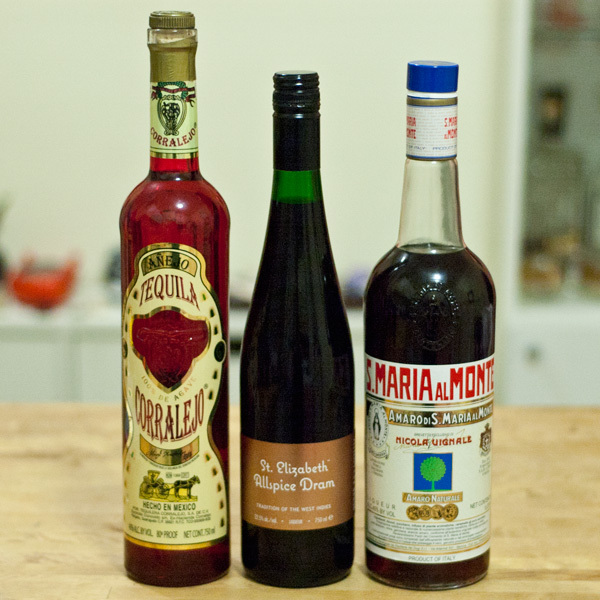 Santa Maria al Monte: This is my favourite Amaro and I just couldn’t wait any longer to have it! I feel like Santa Maria is somewhere between Averna and Fernet but drier and less intimidating. Easy to sip neat. If you can have a taste, do it. If you can buy a bottle, do THAT instead. I’ll be sipping this all winter long! Thanks for reading! The cocktails will be coming soon!